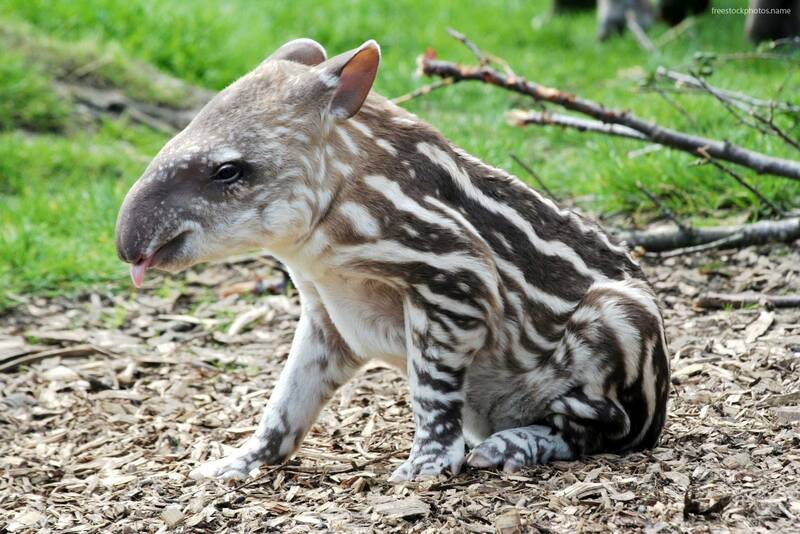 Tapir wallpapers for your PC, Android Device, Iphone or Tablet PC. 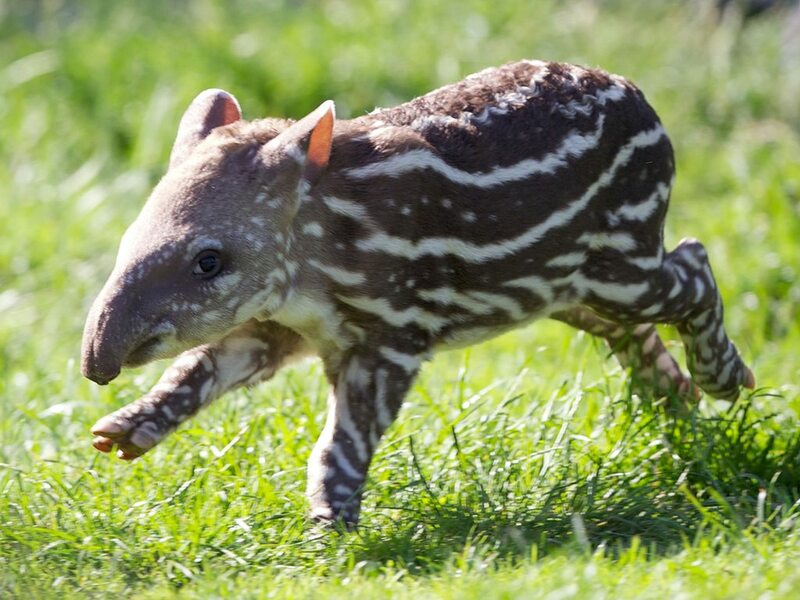 If you want to download Tapir High Quality wallpapers for your desktop, please download this wallpapers above and click «set as desktop background». You can share this wallpaper in social networks, we will be very grateful to you. 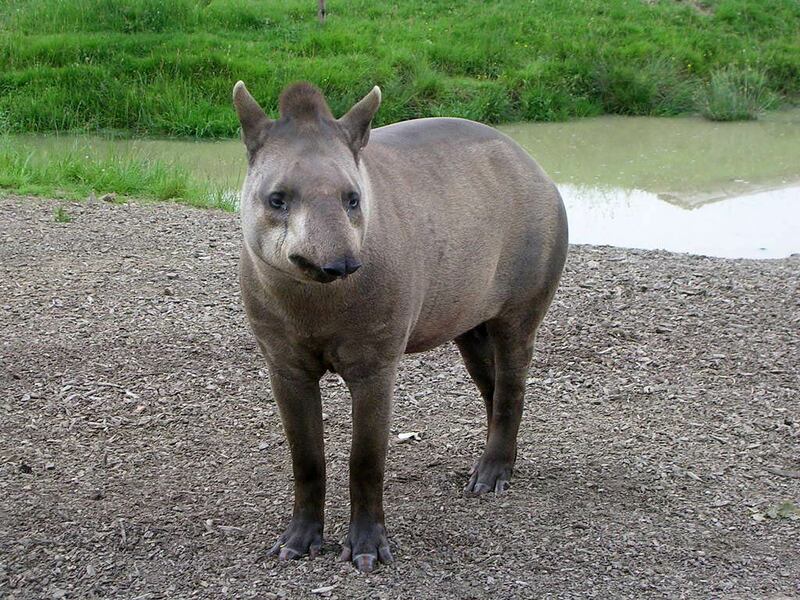 Tapir is a herbivore, referring to the order Perissodactyla. 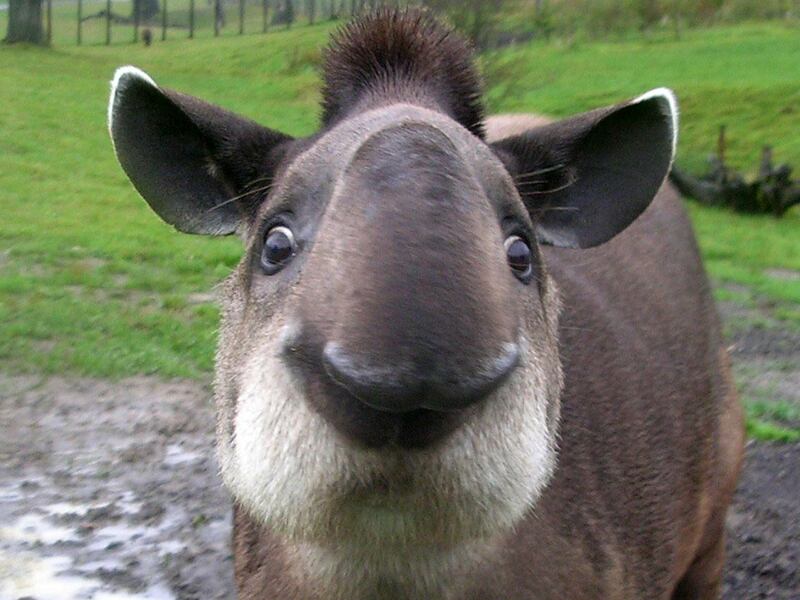 All tapirs are combined in one genus, in which there are 4 species. 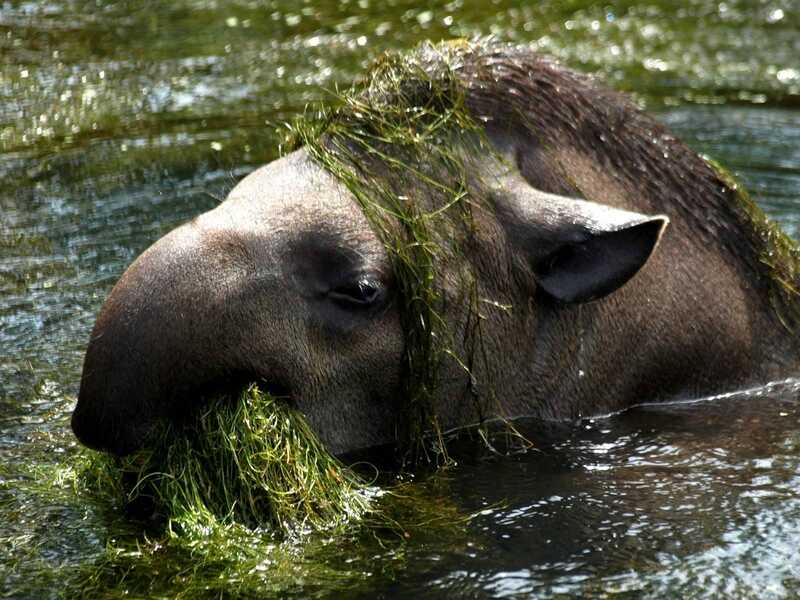 The animal is very old and lives on the Earth about 60 million years. Previously, it was widespread throughout the world, in our own lives only a few days in South America and south-east Asia. At the same time the number of populations is very low and is under threat of extinction. 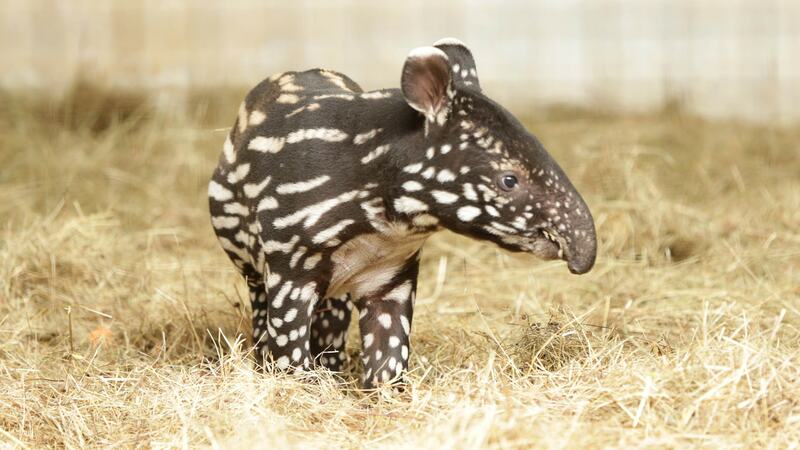 It is the largest species of tapir and the only all living in Asia. It lives on the island of Sumatra and the Malay Peninsula. The individual members of the species found in Cambodia, Vietnam and Laos. 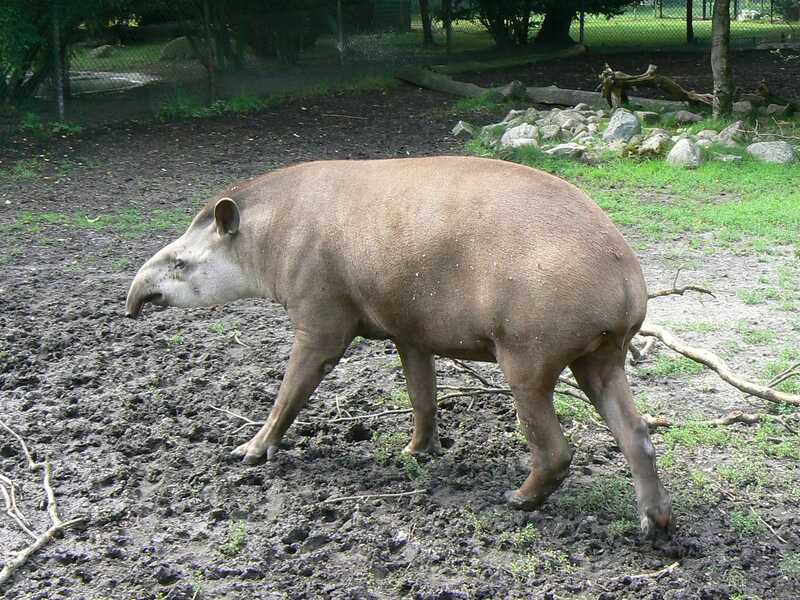 More 150 years ago, this animal was common in Indo-China, and now lives only in certain areas, isolated from each other. In this animal on the back and sides of a large light gray spot (saddle). Hence the name. The rest of the body is black except for the tips of the ears, which have the same light gray color as the saddle. This color is good animal masks. From a distance it could be mistaken for a large stone. The coat is short, and the skin is thick and coarse. Thicker often it on the neck and head and provides protection from predators teeth. Build a massive, strong legs. Muzzle ends with a small flexible trunk. It is fused with the upper lip and nose. The tail is short in length and up to 7-10 cm, on the front legs 4 by pin, rear finger 3. 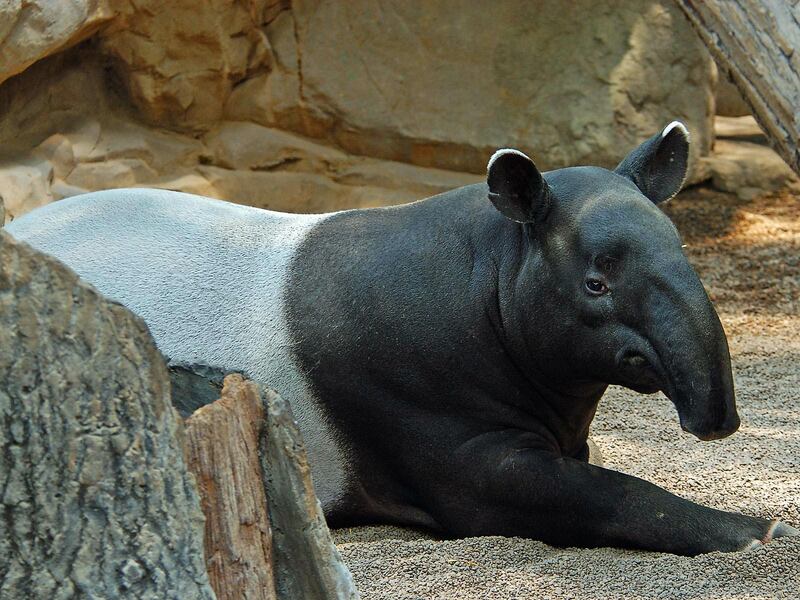 Malayan tapir has very poor eyesight, but his well-developed sense of smell and hearing. With regard to size, the females are slightly larger than males. Body length ranges from 1.8 to 2.5 meters. Height of 90-110 cm. Body weight is 270-320 kg. Caught some specimens weighing up to 500 kg. Gestation lasts 390 days. In the light there is one cub weighing about 7 kg. Fur his Red and diluted with light spots and stripes. Adult coloration it acquires in 7 months of age. Dairy feeding lasts 8 months. Sexual maturity comes at the age of 3 years. 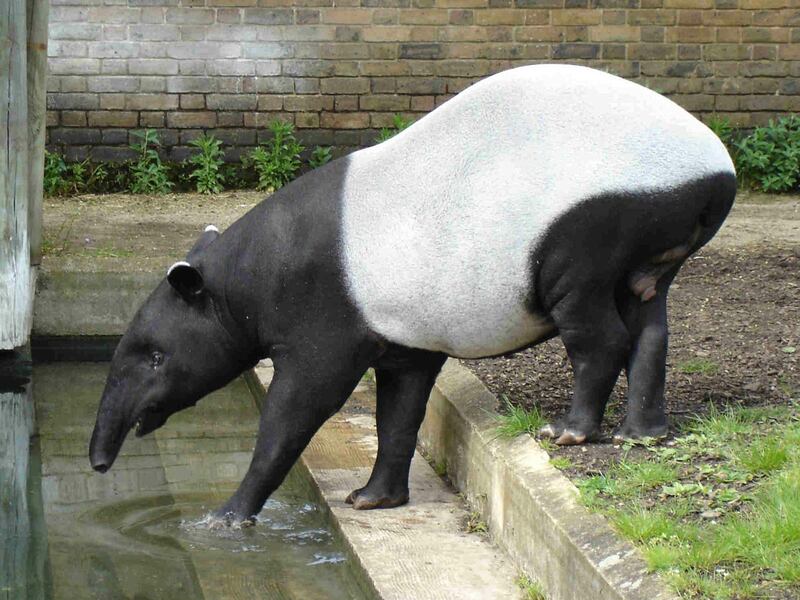 Lives Malayan tapir in the wild for 30 years. It feeds on plant food and can inflict a certain damage to crops, causing human discontent. 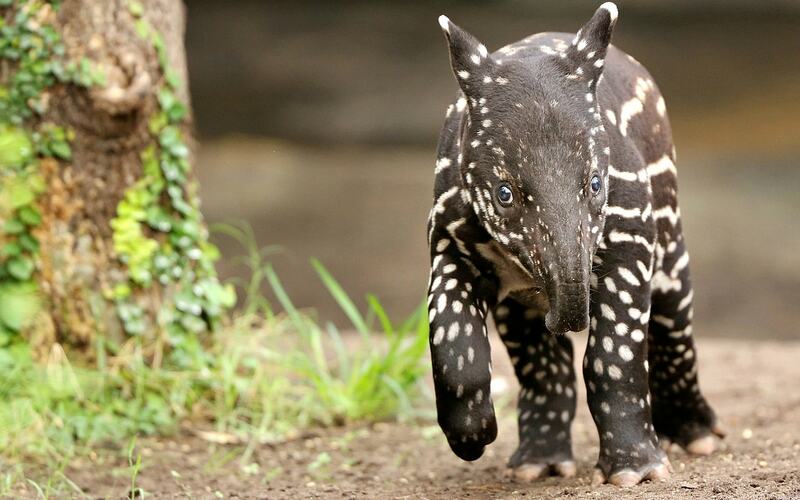 South American Tapir live in the tropical forests of the Amazon to the east of the Andes. Habitat extends from Venezuela and Colombia to Brazil, Argentina and Paraguay. 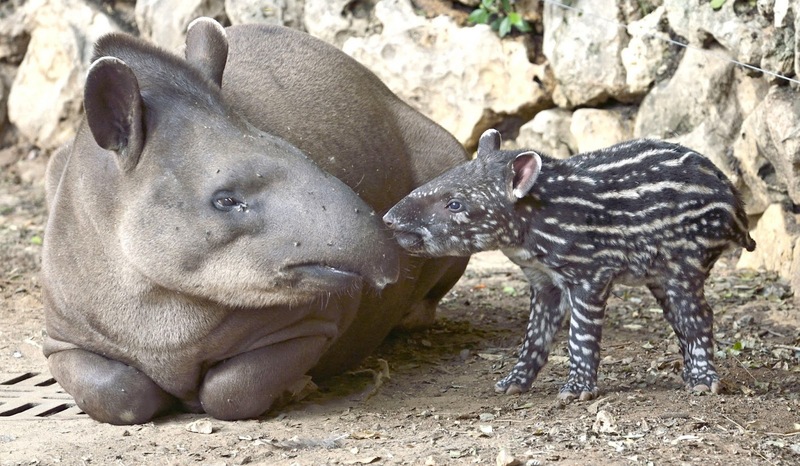 In the west of animal lives in Peru and Ecuador. Color dark brown wool. Abdomen and legs lighter sides and back. The tips of the ears edged with gray fur. Cheprakov absent. It is the prerogative of only the Asian species, and they are deprived Americans. 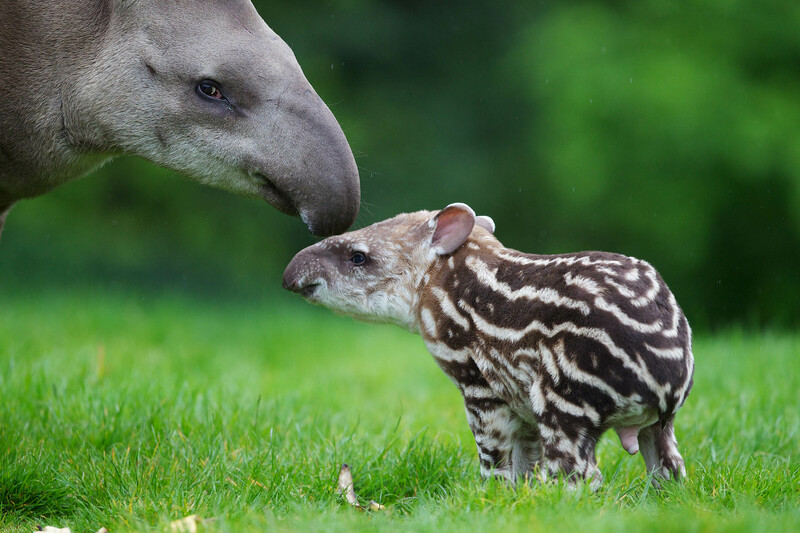 The length of the animal reaches 1.8-2.5 meters. Height 80-110 cm. The average body weight is equal to 230 kg. Maximum weight up to 330 kg. At the back of the head region has a small mane. Build muscular, strong legs and strong. The front feet 4 fingers on his hind 3. Representatives of this kind is perfectly swim and dive. Life expectancy is 25 years. Centenarians live up to 30 years. 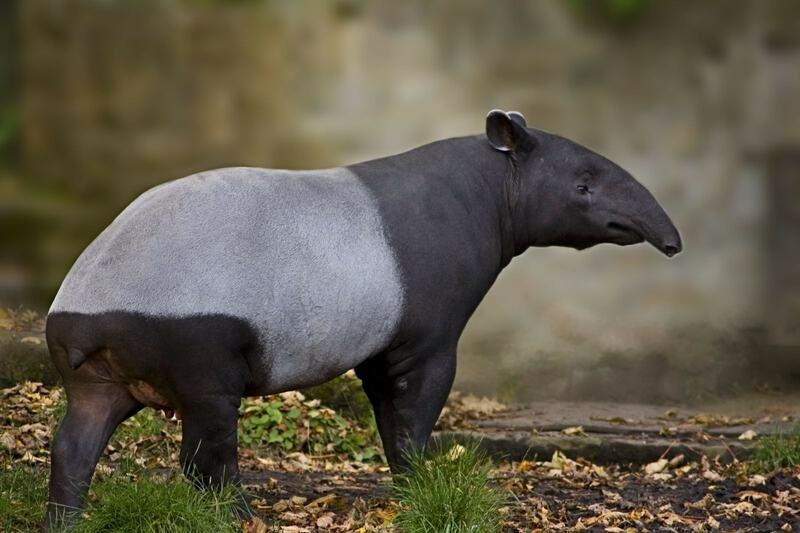 This tapir very many enemies. The main ones are the black caiman, the puma, jaguar and the anaconda. In case of danger, the animals immediately run to the water to escape the teeth of large predatory cats. But with the crocodiles and anacondas harder. Those great hunt in the water. Therefore, the poor mammals live between 2 fires. 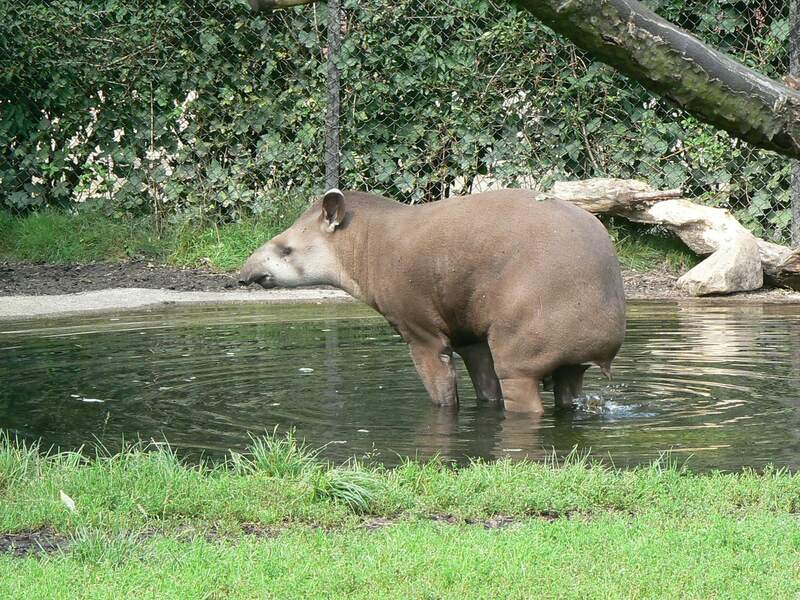 South American Tapir lead a solitary lifestyle. However, it is common to all members of the genus. His territory is aiming animal urine and does not start up at her fellow newcomers. Power consists of plant foods. In addition to the branches and fruits are eaten as algae. Gestation lasts 390 days. Born one cub weighing up to 7 kg. Dairy feeding lasts 8 months. Sexual maturity in 3-4 years. 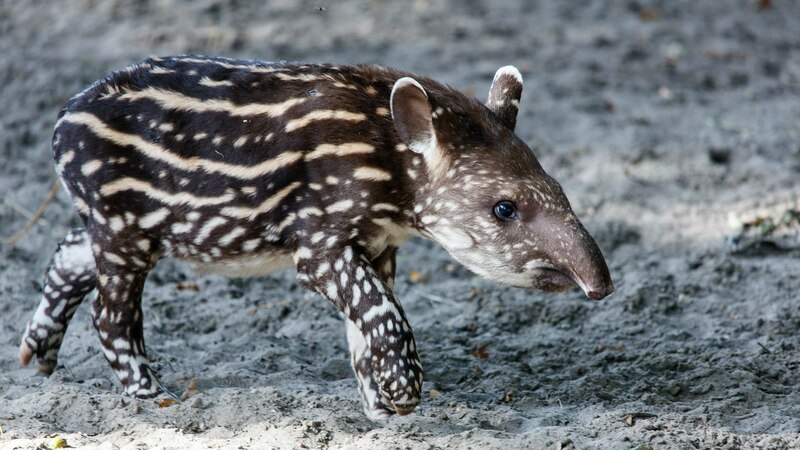 The mountain tapir is the original inhabitants of the Andes. He inhabits in Colombia, in northern Peru and Ecuador. 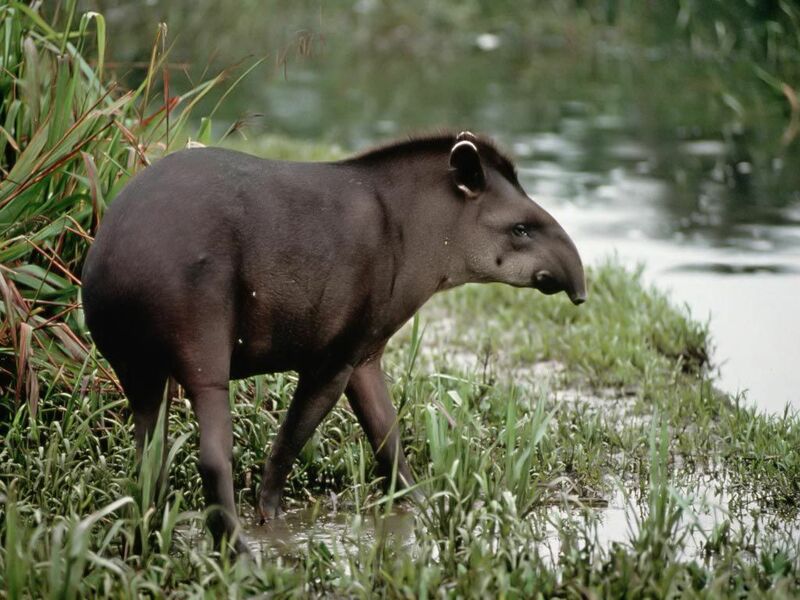 This resident of mountain forests and plateaus. The life of an animal is at a height of 2 thousand. Meters to 4.5 thousand. Meters above sea level. The habitat extends to the eternal glaciers. Among this type of snow does not live. The coat has a black or dark brown. Quite often, it is diluted with blond hair, interspersed with a black coat. In the area of the belly fur lighter, the same is observed on the cheeks. Lips edged white stripe. Similar strips are on the tips of the ears. In this animal, considering the environment, the wool is long and fluffy. Body length reaches 1.8 meters. Height of 75-100 cm. Weight ranges from 150 to 220 kg. Females are heavier on average 10% of males. There is a flexible proboscis and tail. Number toes analogous to other species. The diet consists of leaves, twigs and fruits of plants. Gestation lasts 390 days, a baby born weighing about 6 kg. Dairy feeding lasts 5 months. Sexual maturity occurs at 3 years of age. Life expectancy in captivity is 27 years. 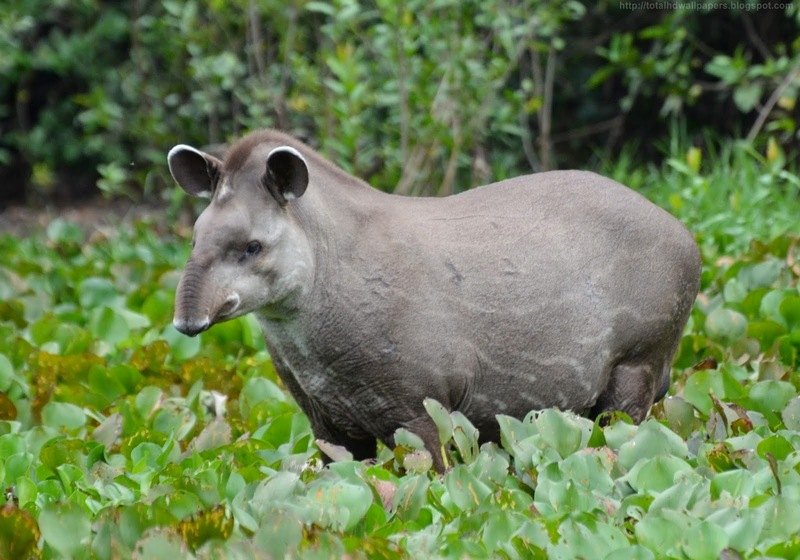 How many mountain tapir live in the wild – is unknown. This species is found in Central America and captures a small portion of the territory of South America. It can be seen in the south of Mexico, and in the north of Colombia with Ecuador. The animal is named after American zoologist Spencer Baird. He prefers solitary lifestyle, as well as relatives. He lives in dense thickets. Excellent swims and dives. In case of danger hiding in the water. It feeds on plant food. 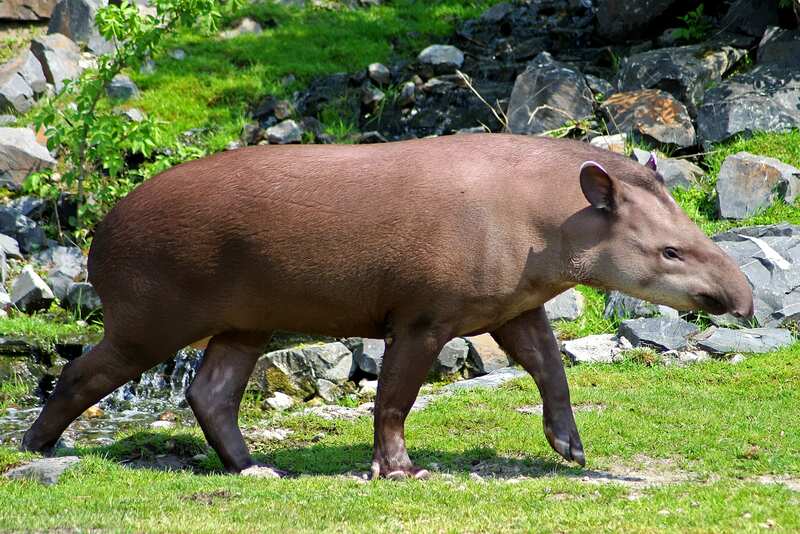 In Baird tapir has a short mane on the nape. The coat is dark brown. On the cheeks and neck are observed spots cream. Muscular torso, the tail is short, there is a small trunk, the number of toes is the same as in other species. The body length on average reaches 2 meters. Height is 120 cm. Body weight ranged from 250 to 320 kg. Caught specimens weighing up to 400 kg. This species is among the most powerful American counterparts. Gestation lasts 390 days. The litter is usually one kid. The color of his skin is reddish-brown with pale spots and stripes. 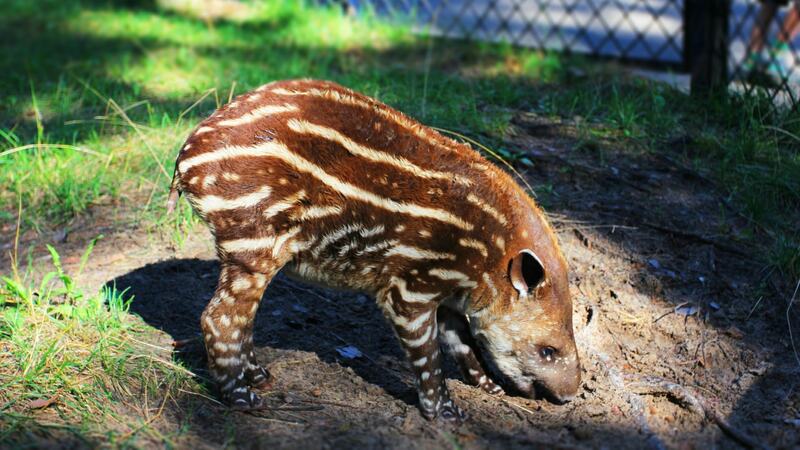 At 7 months of age the animal acquires adult coloration. Already in the 3-week old newborn swims well. Dairy feeding lasts 10 months. Sexual maturity in 3-4 years. life expectancy is 30 years. Some individuals even live up to 32 years. 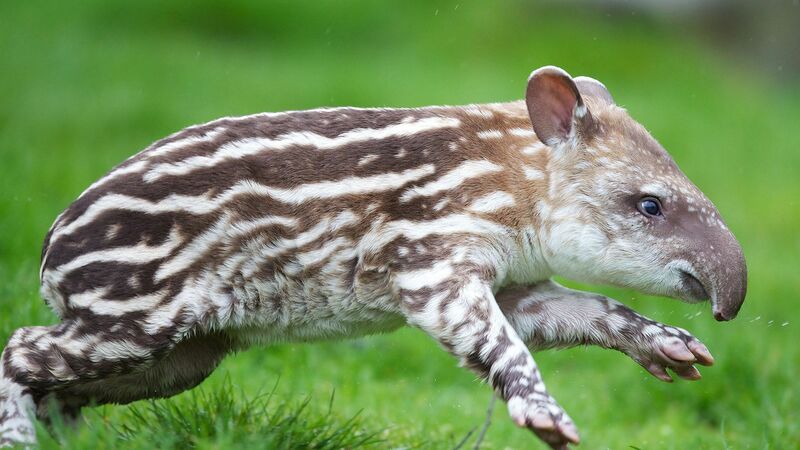 All that matters is that Baird’s tapir is a very cautious animal. Its very difficult to detect both people and beasts of prey. Despite this, the number of species is very low and amounts to only about 5 thousand. Individuals. It affects ruthless felling of tropical forests and the reduction of natural habitat.